programs and the development of furbearer habitat conservation approaches. After 25 years in our profession, Scott still feels fortunate to have made this his career choice indicating that his satisfaction is in no small part due to his enjoyment of his fellow colleagues. As a long-term member of the Western Section of The Wildlife Society, Scott looks forward to the challenge of launching the British Columbia Chapter and helping it to grow and thrive as an entity where members can find the support, energy, and learning resources they need in pursuit of a rewarding career. Equally important to Scott is to help make the B.C. Chapter fun. Bill has been conducting applied research of wildlife in British Columbia in British Columbia for 20+ years. Each project focused on how to improve conservation and management of rare species or ecosystems typically of carnivores. He has helped run major field projects on wolverine in northern BC, the Greater Yellowstone Ecosystem in the US, and helped run field projects for Fisher in Dawson Creek. Bill also played a major role in research on Northern Goshawks in the East Kootenays and worked in close collaboration with other project in northern BC and coastal BC. These projects provided key data supporting two major management documents outlining Best Management Practices for northern goshawks. Bill recently completed a long-term experimental study on trophic cascades in grasslands including collecting extensive data sets on songbirds, small mammals, plants and insects, and continues to work to conserve wildlife habitat and preserve hunting, fishing, and trapping opportunities in British Columbia and beyond. His current projects include ecology and conservation of sockeye impacted by hydroelectric dams, wolverine diet and population genetics with the Yukon and BC Governments, population genetics of fisher, grazing impacts of restored bison populations in the Yukon and new long-term projects on landscape connectivity for lynx in northern BC. Tyler has over 15 years of experience as a wildlife biologist. He grew up in Hinton, Alberta where he spent a lot of time outdoors and developed a passion for wildlife. He has a PhD and Masters degree in wildlife ecology and management from the University of Calgary. For the last two years he has been working for the provincial government in the Forest Analysis and Inventory Branch. He spent one year as a Director of the Alberta Chapter of the Wildlife Society before he moved to British Columbia. He is excited about the opportunity to grow the British Columbia Chapter of the Wildlife Society and to continue to get to know members of British Columbia’s community of wildlife professionals. Pat joined The Wildlife Society in 2012 because it enabled her to connect with a broader group of scientists than ornithological or plankton groups, and she liked the integration of so many different fields and the broad and diverse expertise of the members. She is currently a Research Associate at Simon Fraser University and director of Kahiltna Research Group. 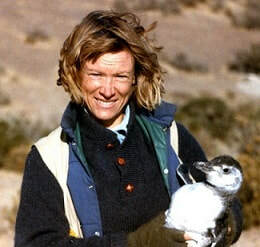 She has conducted research on seabird ecology and food web structure throughout the world, from Alaska to Argentina and Hawaii to France on species such as tufted puffins, kittiwakes 4 species of gulls, 3 species of terns, Magellanic penguins, to western sandpipers and the anchovies, sandlance, and herring and diatom species they consume. Pat was a professor in the Biology Department at California State University before she moved to Canada, and she and her students focused on many aspects of ecology, especially foraging dynamics and the food web of seabirds, and also on habitat assessment and long-range planning for nonprofits and governmental groups. Pat has been an officer on the board of the Pacific Seabird and The Waterbird Groups, and organized science workshops for the Society for Women in Science & Technology. In her spare time she backpacks and cross-country skis, and enjoys exploring countries all over the planet with or without her family. As the Student Director for the BC chapter of TWS, Ashley links university students with working wildlife biologists. She was also the outreach coordinator and secretary for the UBCO TWS Chapter for the last two years. Ashley recently completed a BSc (Hons) in Zoology at UBCO. Her undergraduate honours thesis project focuses on the distribution of freshwater sponges in the Okanagan area. Ashley also spent last summer at Bamfield Marine Sciences Centre studying marine behavioural ecology and survey methods of coastal wildlife. Prior to starting her undergraduate degree, Ashley spent 7 years traveling and working abroad. She has lived in over 8 countries and traveled to many more. She loves to be outdoors, especially when it involves diving. Ashley plans to obtain a graduate degree focusing on marine conservation. She is interested in understanding trophic cascades and is fascinated with sharks. Ashley is determined to be a major part of the ocean conservancy community and plans to spend her life researching, understanding, and educating others on the issues our oceans are facing. ​Rod Davis is the Chair of the Managed Forest Council, an Adjunct Assistant Professor in the School of Environmental Studies at UVic, and the President of the BC Chapter of The Wildlife Society. Prior experience includes a 35-year career with the provincial government working on fish and wildlife conservation, forest and range practices, land use planning, and environmental protection. Rod was presented the Bill Young Award for Excellence in Integrated Forest Management by the Association of Professional Biologists of BC and the Association of BC Forest Professionals in 2006. He has a PhD from the University of Victoria focused on wildlife conservation and is a Registered Professional Agrologist. His interests relate to implications of resource development and climate change on wildlife and ecosystem conservation. Agnès has been involved with TWS since 2010. She facilitated the creation of two student Chapters, one at Trent University (Ontario), and one at the University of Winnipeg. She has formed strong bonds with other Leadership Institute alumni, and considers that many of her professional successes are tied to people she has met through TWS. She strives to provide mentoring and networking opportunities to current Student Chapter members so that they can reach their goals in the wildlife field. Agnès is originally from France, where she conducted her M.Sc. on migratory patterns of humpback whales and “divorce” in alpine marmots. She had a keen interest for science-based wildlife management and conservation of large mammals, so she moved to Canada to pursue a Ph.D. on gene flow patterns of American black bears at Trent University. After teaching university biology courses and developing an environmental consulting business in Winnipeg, she is now working as a wildlife biologist for the provincial government in Northeast BC.